Personally I think this is one of the greatest Ray Daley episodes and would have worked just as well in the Terry McCann era. The author Tony Hoare has cleverly come up with an idea for Bert's taxi and although you have your suspicions about Susie (played by the lovely Susannah Doyle) the gradual change in opinion that the viewer gets of her throughout the episode is very cleverly done. All of the regular characters are used well in this one I think and it is proof that any show is only as good as its script. There are also some scenes in Manchester and Heathrow airport and I just feel when watching this that Tony clearly thought out how best to use all the characters. Arthur is in 'do you need a Minder my dear?' mode, taking blatant liberties with Bert & Doreen's house and Ray gets a great punch up at the end (proving he can still handle himself) and this a fantastic effort in Minder's final series! Series 10 does actually have some strong stories in it as well as a couple weaker ones. Totally agree with your views on this one jno, a top class episode. Thought the northern cops were very sinister, you can imagine them being successors to the ones in Red Riding. Been nice if the script had made more out of them. Susie's deal with the local law seemed just a bit too pat at the end. I don't know if you'd ever really be safe from people like that. Still a good episode though. Watched this episode a few times recently, brilliant. "The sort of place no one would look for anyone... Bert and Doreen's gaff." Yes agree jno, a top Ray ep Love it when Arthur realises the cheque has bounced Only thing is in this ep...personally I really don't like the coppers on Arthurs tail in this one. But apart from that, the pace, script, build up etc is excellent. Ahhh, Susannah Doyle, what a way to go! I couldn't agree more daytona355, makes this one even more enjoyable! Only thing is in this ep...personally I really don't like the coppers on Arthurs tail in this one. They're not really in the same league as Morley, but I think the script does a good job of working them into the story as new plod on the manor. Arthur's bemusement at the one with the pony tail is classic. Gave this a watch this evening, a top, top episode in my opinion, right up on the top of my favourite lists. A good story, great dialogue, comedy and a punch up at the end, what's not to like. Arthur at his dodgy best, just a superb episode. The ending with Arthur sneaking out of the house when Rays parents arrive back was superb. Classic Arthur. I knew a person who was in the airport when Ray was dropping the parents off, a small world indeed! I just watched this for the first time and enjoyed it a great deal. Definitely one of the best episodes of Series 10. 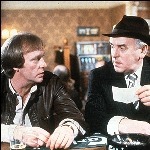 I don't think Minder did any bad episodes.Season 10 and still going strong.Lots of Dave and those Tall Orders!Classic! This episode was in my opinion on parr with any other great episode in the Ray or Terry years. I looked at the locations section on the main website to see where Ray's parents' house in this episode is. It is next to Pinewood studios! And the red phone box is still there.